Halfway of 2013, I underwent a minor abdominal surgery. It was quite not so easy for me to get confined in the hospital as I was not really used to attach myself in a dextrose 24/7 with all the blood and the needles buried in my veins. The better side of it was I did not have to cook for myself and there was no need to fuss on what foods should be prepared since an in-house nutritionist would already take good care of all the meals. Roughly a week has passed; after getting satisfactory results from all the required biometric tests, I was finally given the permission to go. That was really a sigh of relief to me. Imagine my dilemma. One, I had to push myself to get well fast as I had a lot of work left behind. Two, my hospital bills were causing me emotional stress everyday. They were slowly rocketing high, my healthcard might exceed its limit and I might not be able to pay out the excess amount. My gracious goodness! How did I get through that difficult phase deserves a musing for a different blog category. Before being discharged from my hospital bed, I was given a long list of to-do’s and not-to-do’s (foods to eat and not to eat included) and advised by my doctors to stay at home for a couple of months or so (ideally on my bed, what the?) to fully recuperate. Hanging out on my bed most of the time for almost a couple of months was not really a big deal to me as I really wanted to get well as soon as possible so I could go back to work before my bank account would run dry. Thanks to my laptop, to facebook, to twitter, to blogspot-dot-com (finally, I jumpstarted with this long overdue project of blogging myself away! ), to the noontime shows and telenovela on television, and to my smartphone (and all the games and apps installed in it) for always keeping me company. I would have turned into a hermit imprisoned inside his nook under the mossy rock if not because of them. 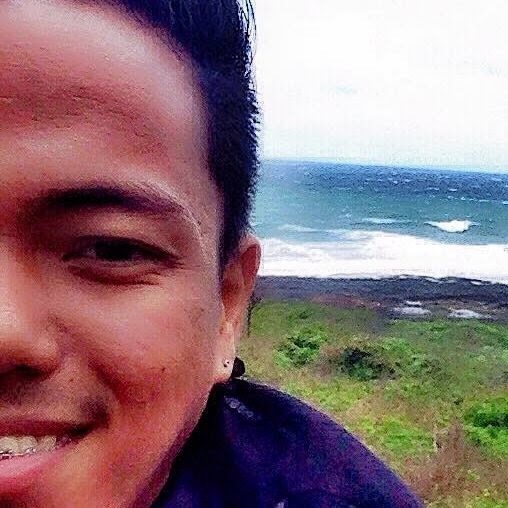 I got all the news updates and the latest happenings from all these technologies and social media. The challenging part of my staying-at-home recovery period was choosing the best foods to prepare for myself. I really had to be too picky since my body could not accept a full solid meal yet. I had to settle on soft and less meaty, and probably drown myself with soups and juices. So, bid good bye to pasta, cake, ice cream (as I was having some lactic intolerance), pizza and anything red meat, too spicy and deep fried, at least for the mean time. It was not really that bad at all. At least, I got to force myself to eat nutritious and good quality meals. And the dish that truly redeemed my grace was the multifarious and the eternally soothing bowl of my sour broth dishes or more locally acclaimed as sinigang. Since sinigang has as much varieties as the number of cooks cooking them, eating every version of it every single day will not bother me at all. Sinigang is a quintessential Filipino broth dish that utilizes fruits, usually of sampalok (tamarind), kamias (bilimbi), calamansi (calamondin), bayabas (guava) or mango, as the basic souring ingredient. It is an ever-present comforting dish that is well-loved by Filipinos and foreigners alike. Whenever someone in the family is feeling a little under the weather, a bowl of this warm soup would serve as a boost that gives extra energy to sweat the fever away and feel better eventually. If I were to baptize an alias for sinigang, I would call it “Sour Soup for the Sick Body”. Its refreshing feel with a tangy kick is always way better than your pills of paracetamol. I would rather go for a sip to ease away those simple colds, provided they are not coming from instant powdered sinigang mixes. I am quite avoiding them as, in my observation, they are loaded with too much MSG, and the nutrients that should come from real souring fruits are already exploited. I am not a hater of these powdered sour mixes though; I just prefer it all natural so as not to defeat my purpose. Always fresh catch and fresh ingredients! Last time, I was able to blog on topic on Sinampalukang Manok - a chicken meat soup soured with tamarind fruit and young tamarind leaves. This time around, I would like to write about a different spin on how to cook sinigang with the addition of a traditional Japanese condiment paste that are normally mixed with dashi stock to make a well-loved Japanese soup, mishoshiru. The presence of miso in the Filipino dishes is an evidence depicting that there really was a marriage that happened between the Philippine and Japanese cuisines which could be dated back before World War II during Japanese occupation in the early 1900s. Since the dashi stock used to make miso soup could be generally prepared using the flavors found in the sea (except for shiitake mushrooms), my Japanese and Filipino forefathers might had cleverly experimented (and maybe ultimately agreed), why not utilize the almost infinite abundance of the live fishes found in our shore – merge them altogether with Japanese miso and the Philippine sour fruits. Thus, giving birth to the mouthwatering and soothing sinigang sa miso. Considered as one of East Asia’s most essential soy products, it is quite difficult to find a substitute for miso in most western countries that could give an equivalent benefits and qualities. One would be lucky enough if he or she live in a place with a nearby Asian food market. Miso is a blend of soybeans, rice and/or barley mixed with salt and fungus kōjikin, fermented and matured similarly to cheese and wine for about six months to three years. The resulting paste, which can be smooth or chunky comparable to the texture of peanut butter, is commonly mixed with dashi soup stock to create miso soup. It can also be used as spread, seasoning sauces and marinades for meats and vegetables. Miso can also be considered as a super food as it is high in protein and contains a number of essential vitamins and minerals that help protect the immune and the digestive system. Some scientific studies suggest that regular consumption of miso can help treat radiation sickness and prevent breast cancer. Though we came to know miso as a traditional and highly indispensable ingredient in Japan, would you know that there were artifacts and evidences that fermented soy paste were first used as ancient Chinese medicinal cure? A silk manuscript entitled Wushi’er Bing Fang (Prescriptions for Fifty-Two Ailments), believed to be the earliest written record of disease treatment that was compiled sometime between 1065 and 771 B.C., was discovered during the excavation of the Ma Wang Dui tomb (dated sealed: 168 B.C. under Han Dynasty) at Changsha, Hunan. Chiang jiang (soy bean paste) is one of the numerous drugs listed in the records and contained in the unearthed sachets and pottery jars along with the manuscript. Soybean hishio, miso, and soy nuggets started to be made in Japan at around 700 A.D. by the government bureau annexed to the emperor’s kitchen, Hishio Tsukasa. How it reached the cookery of Japan’s general populace, I will leave the rest to history. 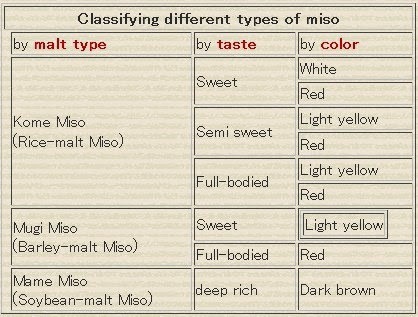 Miso appears in a huge assortment of warm and somewhat earthy colors ranging from light yellow and rusty red to dark chocolaty brown and muddy black. Each kind also has its distinct flavor and aroma, which can be mildly sweet and subtly refreshing to more salty and strongly savory, and at times almost meaty. The depth of color can be an indicator of the fermentation age and the strength of flavor of miso. The darker the appearance means the longer it has been aged and the stronger the taste will be. 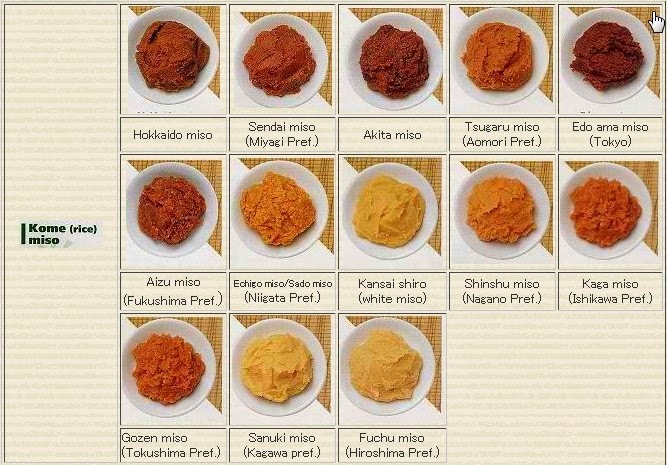 I am pretty sure that many of us already have an idea about the different types and composition of miso paste but I believe it is still worth taking a quick glance and review of our Japanese cookbooks once in a while. Miso paste is generally categorized into three: white miso, red miso, and a mix of both. Shiromiso or white miso – it is made from soy beans and huge proportion of rice and usually appears golden-yellow to medium brown. It has a slightly sweet flavor suitable for making miso soups, and dressings and marinades for fish. It has a wide range and multipurpose use in Asian cookery. Akamiso or red miso – it is the general term for miso with reddish to chocolaty brown in color, which is a combination of soy beans, barley and other grains. It has a rich umami taste due to the longer fermentation process. Its strongly savory and salty flavor is perfect for hearty soups, and glazes and marinades for poultry and red meat. Awasemiso or mixed miso – it is a combination of two or more different types of miso together. It is a versatile choice for general cooking. Other miso varieties, labeled as dashi iri, already have dashi added to them. This type of miso is the most convenient way to make miso soup as no need to put in dashi stock on it. Just add a spoonful in hot water (just like instant coffee), add some tofu and your favorite garnishes, and off you go. The flavor, scent, grain quality, and form of miso all differ depending on the region where they come from and in the season. Other important consideration that contribute to the taste of a particular miso include temperature, length of fermentation, amount of salt, type of kōji, and the fermenting vase used. Check out my borrowed illustrations below for Japan's regional variations of miso. Photos courtesy of Japan Federation of Miso Manufacturers Cooperatives. And with no more further ado, I would like to bring to your dining table a good old recipe that serves as a meeting point between the Japanese and Philippine cuisines. We, Pinoys, lovingly call it - Sinigang na Bangus sa Miso (Milkfish in Sour Miso Soup). In a huge saucepan, heat the cooking oil over medium heat. When the oil is already spattering, sauté the onions and ginger until the onions are translucent. Add the tomatoes and patis. Continue cooking until very aromatic but do not wilt the tomatoes. Put in the kamias fruits and water. Increase the heat to high. Stir the mixture and bring to a boil. Add the milkfish and reduce the heat to medium low. Simmer for 10 to 15 minutes. Scoop about one cup of simmering liquid into a bowl and carefully mash in the miso to loosen and dissolve. Add the mixture back into the saucepan and stir the liquid to combine. Keep simmering over lowest heat for 2 to 3 minutes. Put in the mustard leaves or romaine lettuce and cook for 1 minute. Season with salt and pepper. Remove from heat. Place in a serving dish and serve with steamed rice while the soup is hot. Enjoy! Heating the miso too much might kill the live helpful bacteria. Do not boil over high to optimize its benefit. You may use a wide variety of natural souring ingredients such as sampalok (tamarind), bayabas (guava), green mango or santol (sandor/ wild mangoosteen). They are perfect for miso. There are lots of fish types that you can substitute for this dish. In my opinion, the best alternatives are maya-maya (red snapper), lapu-lapu (grouper), salmon, talakitok (trevally/ jack), tambakol (yellowfin tuna) and tilapia. Other variation uses hugas-bigas (rice wash water) for the broth instead of plain water. This will give a richer flavor to your soup. If you want to try this, it is advisable to prepare your rice ahead of time. Wash your uncooked rice with cold water and set aside the second rinse. I really enjoyed your post and how you integrate different cultures in your cooking. Thumbs up ENZ! Wow! Thank you for the kind words, Sir! It is a great pleasure.